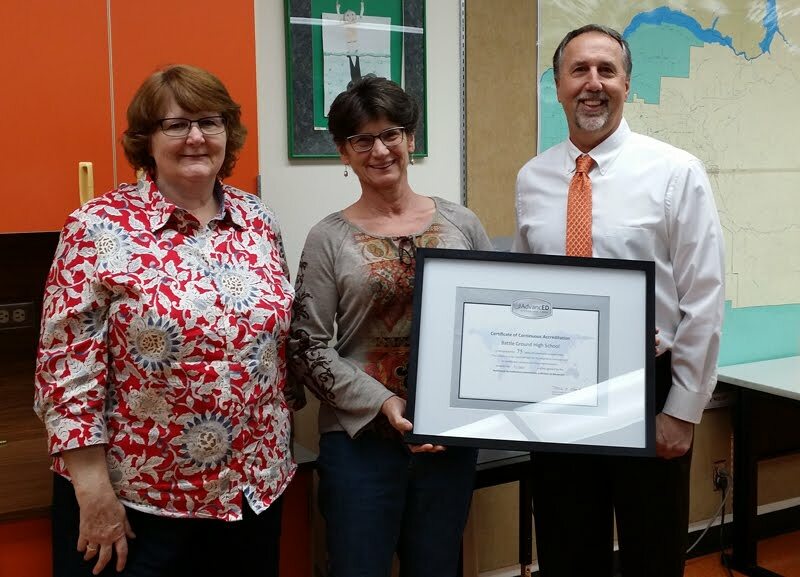 Battle Ground High School is celebrating 75 years of continuous accreditation, a feat that is achieved by just a small number of schools in Washington. In fact, Battle Ground is the only school in the state to reach the milestone this year. "It's a national standard of excellence," said Battle Ground High School Principal Mike Hamilton. "To have outside experts come in and review every facet of your school's operations and then provide feedback on the great things you are doing and recommendations for improvement is an important, healthy way to grow as an organization and a school." Accreditation is a quality assurance process that requires a school to be evaluated every five years by an external entity to determine if standards are met and improvements made for continuous growth. 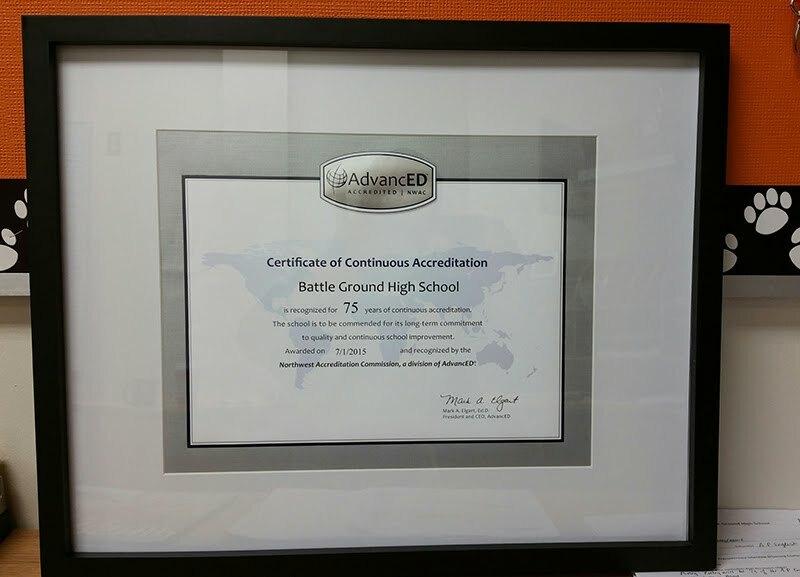 BGHS is accredited by AdvancED, a national, nonprofit organization that conducts rigorous, on-site external reviews of PreK-12 schools and school systems to ensure that learners realize their full potential. To be accredited, BGHS must collect and analyze student performance data; conduct a self assessment; survey parents, staff and students; summarize the school's direction, achievements and challenges; create an improvement plan; demonstrate compliance; and participate in an external review. In addition to an external evaluation every five years, Battle Ground also shares status updates every two years with AdvancED. 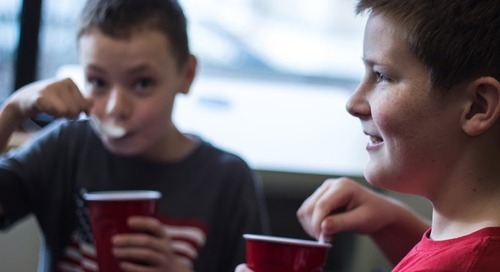 Washington state does not require schools to be accredited; however, about 400 of the nearly 3,000 public, private and charter schools in the state currently have the designation, said Dr. Liselotte Thompson, director of the Washington office of AdvancED. Battle Ground High School was first accredited in 1940. In a letter to principal Hamilton, Thompson of AdvancED wrote, "The continuous improvement processes that your school engaged in as part of accreditation include an in-depth analysis of your purpose and direction, governance and leadership, teaching and learning, resources and support systems, and overall effectiveness. From classroom observations and stakeholder surveys to diagnostic reviews of student performance, everyone from students to parents is involved in the process of continuous improvement." Principal Hamilton credits staff for the accomplishment. "Battle Ground is a phenomenal school with a strong commitment to excellence," Hamilton said. "This sustained performance of accreditation is an amazing accomplishment. I'm so proud of our students and staff and the work we are doing in the community for our students."